Negative reviews are inevitable for any restaurant, but you should see it as a prime opportunity to effectively respond to the review and solve any issues raised by the reviewer. A well-written response isn’t just for peace of mind; it’s also a way to attract more customers. Survey research shows that 44.6 percent of consumers are more likely to visit a business that responds to its negative reviews. However, many businesses aren’t taking advantage of the practice. The same survey also showed that an alarming majority of customers – 63 percent – never get a response to their review. 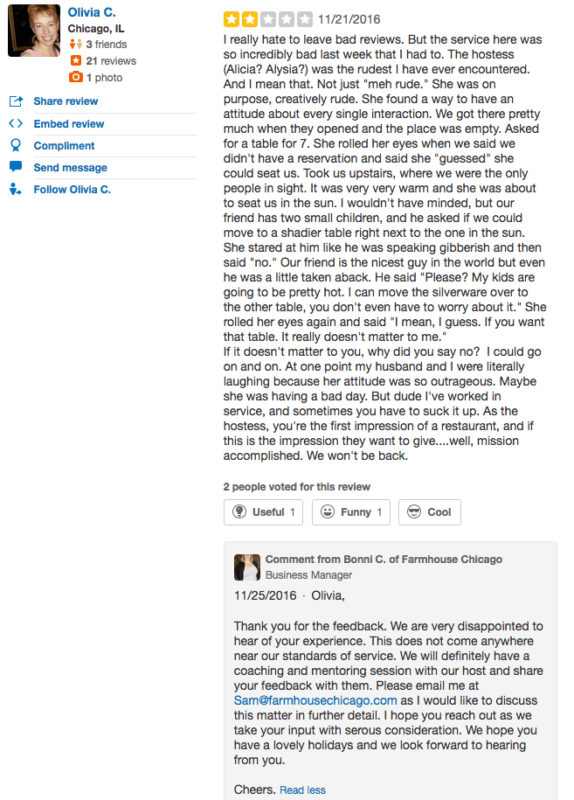 So how do you write a short, yet effective response to a negative restaurant review? Discuss the issue further in private or offline. Ask for a second chance. We’ll go into more detail below about each step in the process, and we’ll do so with the help of a real-world example from Farmhouse Chicago. With each step, we will underline a specific part of the review that meets our criteria for a great review response. Start your response on the right foot with a personalized address, which can be as simple as greeting the reviewer by their first name. You should try to avoid using the generic “Guest” or even “Sir/Madam” greeting because it doesn’t adequately show that you value the customer’s time or feedback. 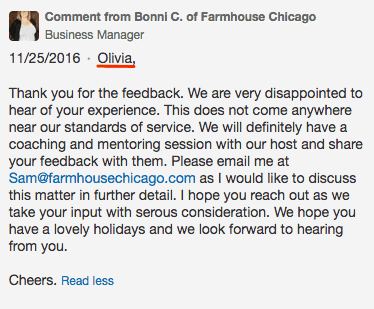 You can further personalize the response by mentioning specific details about the reviewer’s experience. What did they eat at the restaurant? Were they seated in a specific location? Was there an event going on during their visit? These are all details worth pointing out to show that your response isn’t generic and solely directed at their review. Those two words carry plenty of weight especially when responding to restaurant reviews. Most customers don’t bother to leave a review after a bad experience. However, the reviewer in our example took valuable time out of their busy day to write a detailed account of their experience. Make sure you thank the reviewer not only for their review but for their patronage. 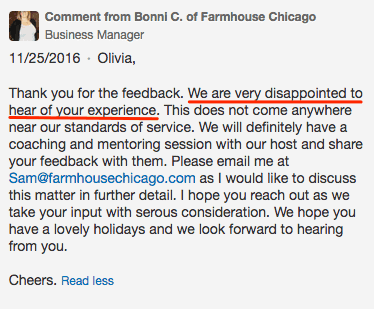 They made a decision to eat at your restaurant and were let down by any number of factors in the experience. Saying “thank you” also shows that you welcome every piece feedback from future patrons regardless of its sentiment, which should help in your review generation efforts. Showing gratitude isn’t enough. 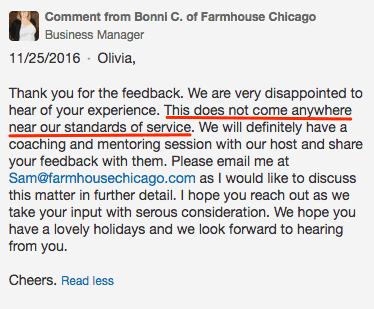 Customers want to hear an apology and know that their experience was below the usual standards of the restaurant. Every restaurant tries to meet the same standard of service and experience with each customer, but that can be a difficult task and mistakes are inevitable. When a reviewer notes it in their review, make sure that you acknowledge and take responsibility for the lapse in quality. Internally, it’s also important that you note the issue and work with other staff to find a solution so that it doesn’t happen again. Multiple reviews that mention the same issue tells potential customers that you’re not using online reviews to spot crucial pain points in the experience. Customers write reviews for the sake of others so use it to your advantage when writing a response. After owning up to the issue, make sure that you provide some details on current efforts to make improvements or significant changes to the experience. If you don’t have any detailed plans in the works, you can always mention that you are looking into ways to improve the customer experience. Just make sure that you act on it and not just hand out empty promises, which can break the trust between a business and its customers. Responses should be short and to the point, but there’s always room for more discussion. Provide an email address or other forms of contact information to encourage a private discussion with the reviewer. This shows that you value each piece of feedback to the point that you’re willing to spend as much time as necessary with each customer to resolve their complaints. Making the conversation private can also prevent the situation from escalating out of your control on a public forum like Google My Business or Yelp. This will only result in a worse outlook for any business that relies on reviews for additional customers. Just because someone left a negative review doesn’t automatically mean they are a lost cause. After apologizing, owning up to the issue, and highlighting potential improvements to the experience, you can invite the customer back to see the changes. Doing so shows even more commitment to an amazing experience for every customer whether they are a first-time visitor or a recurring patron. 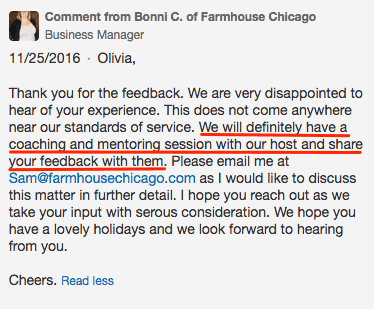 If successful, a second chance can be the perfect opportunity to turn naysayers into promoters who can update their review of the restaurant after the new experience. When done correctly, a review response shows value and care to each customer. Survey data showed that 80 percent of consumers believe that a business cares about them when it responds to their reviews so always think about how your responses build trust and place value in each customer. A well-crafted review response also takes care of two birds with one stone. On one hand, your response can help the restaurant save face with the reviewer who wrote the negative review. On the other hand, the response should also show potential customers your commitment to improving the experience and the vital role that customer reviews play in that process. 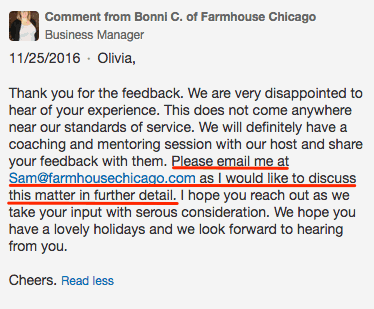 I think one of the biggest turn offs for customers when seeing a negative review can be the business’ response. If a business gets defensive or dismissive about the review it can leave a bad taste in people’s mouths. Apologizing and trying to improve on the problem really shows customers the company is trying their best to create the best experience for the customer. Great article. Thanks Megan Wenzl. And I agree completely. Restaurants should have a process of checking for reviews and try to learn from the less favourable ones. It’s great to get good reviews, but like you’ve written, it’s the negative ones that actually help you improve. Really liked what you’ve written under “Don’t Get Personal”.